"It’s such a privilege to be part of someone's special day. The excitement in a room the morning of a wedding is like nothing else." At your bridal trial we will create the makeup look that’s right for you, whether it’s natural and understated, or glamorous and striking, to help you feel confident and beautiful. A trial is important to make sure you’re completely happy with the makeup and that none of the products irritate your skin – it’s very rare, but it's better safe than sorry! Allow around two hours for the bride’s trial and an hour for each additional member of the bridal party. We will also discuss timings for the big day to make sure that everything runs smoothly. 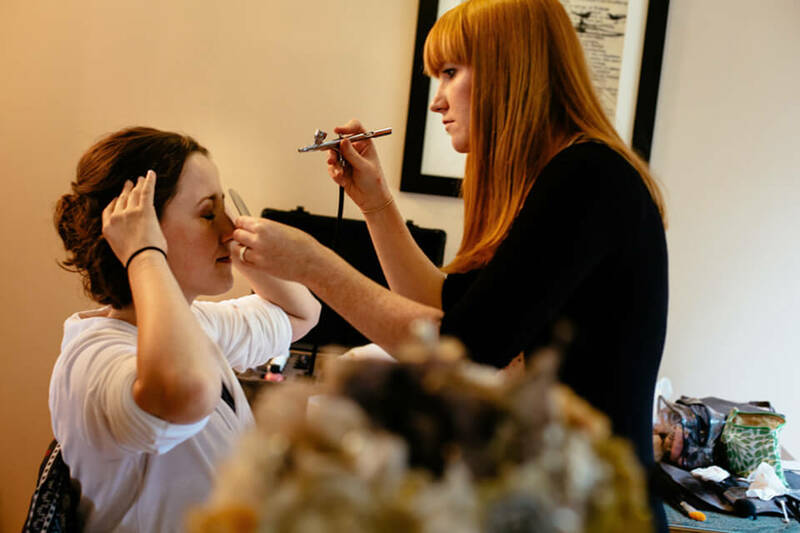 On your wedding day I will arrive in plenty of time at your chosen location and will have notes detailing the make-up used in your trial, but I am always flexible and open to last minute changes! To make sure you’re as relaxed and pampered as possible, allow around one hour for the bride’s make-up and 45 minutes for each additional member of the bridal party. I also offer Airbase Airbrush Makeup. This is a fantastic new product on the market that is perfect for Brides. It provides a flawless finish as it is extremely long lasting. It requires no touch ups, meaning brides and bridesmaids don't need to worry about their makeup for the rest of that special day. £50 trial / £70 on the day. £70 trial / £90 on the day. £30 trial / £50 on the day. £40 trial / £60 on the day. For a full price breakdown please get in touch.